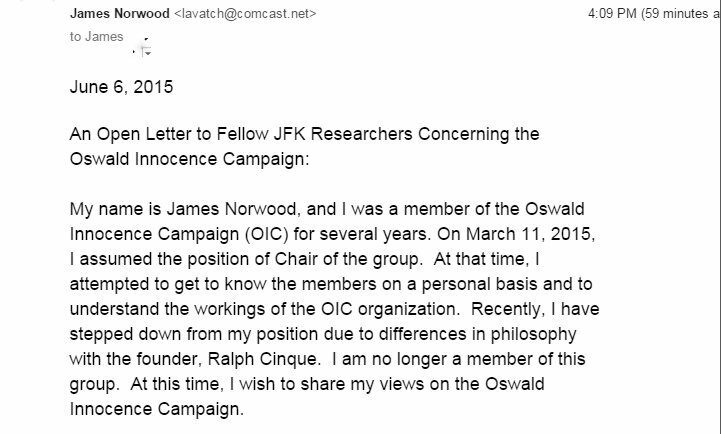 Oswald in the Doorway (not) : the blog of the Oswald Innocence Campaign,debunked by Lance Uppercut: James Norwood - at long last a man of integrity emerges from the wreckage of the Oswald Innocence Campaign UPDATED! James Norwood - at long last a man of integrity emerges from the wreckage of the Oswald Innocence Campaign UPDATED! 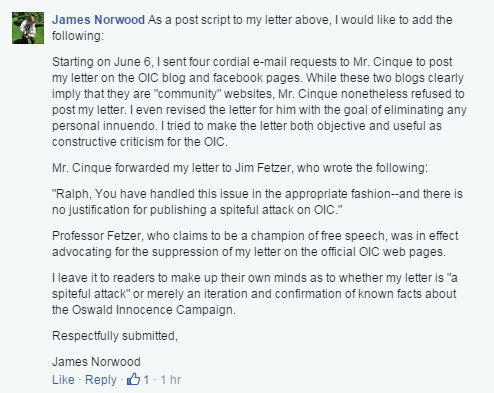 Not having paid much attention to the antics of Ralph Cinque recently I missed the removal of Prof. James Norwood, the recently appointed "chairman" of the Oswald Innocence Campaign from the list of "senior members" on the OIC home page. And as Ralphie himself has been completely silent on the subject of Norwood's departure thanks are due to Joe Backes for bringing the matter to our attention. So there you have it, from the inside. 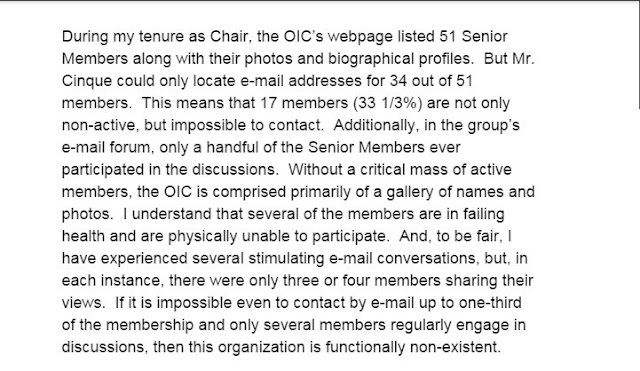 The OIC as an organisation is "functionally non-existent". 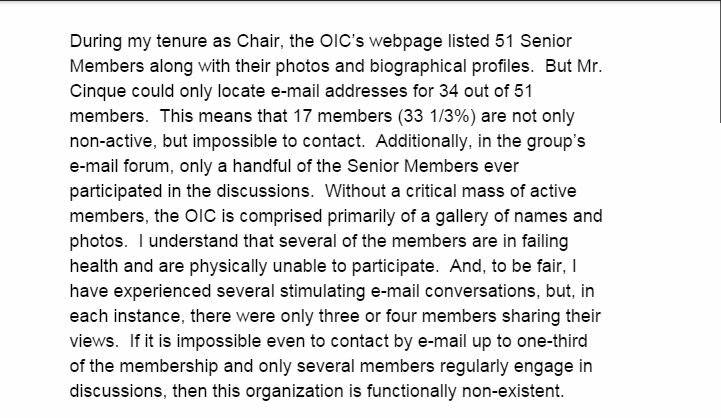 A third of the so-called "senior members" are not only inactive, they can't even be contacted. And of the remainder only three or four participate. The theory of Altgens 6 alteration is "not persuasive" and has never been taken seriously by even a fraction of the research community. Ralph Cinque's incessant garbage postings are not representative of the view of the OIC members as a whole. 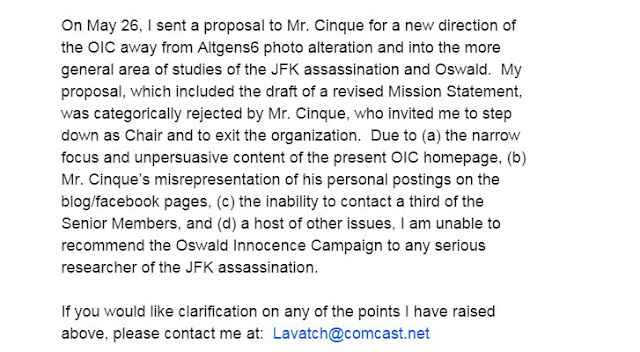 The recently departed chairman of the OIC is "unable to recommend the Oswald Innocence Campaign to any serious researcher of the JFK assassination". 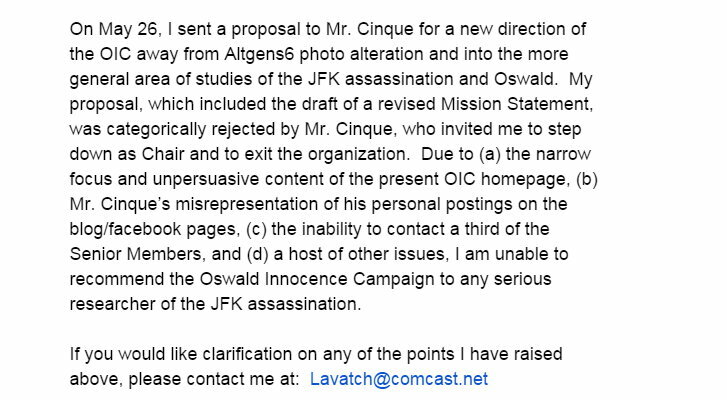 In short, the Oswald Innocence Campaign is, as many of us have long maintained, a vehicle for the vanity of one man - narcissist and serial liar Ralph Cinque. 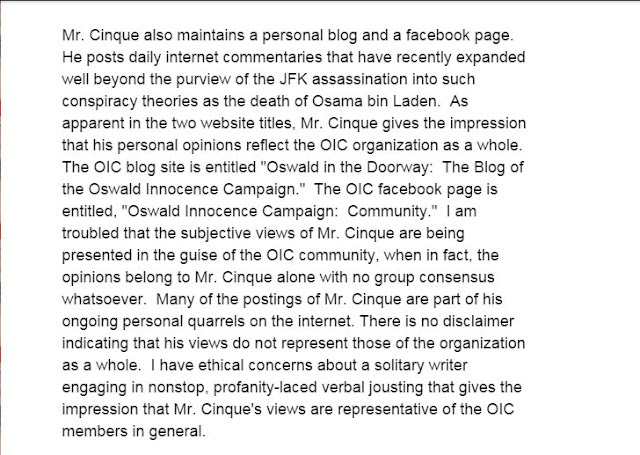 It's long past time for a few other prominent names on the OIC webpage to disassociate themselves from this mess. Do any of them have the integrity of James Norwood? Unsurprisingly, Ralphie has declined to publish James' letter of resignation and has made no mention of it - anywhere. "He has done the OIC immeasurable harm by his abrasive replies to critics and other forms of abuse"
"I have become convinced that he is not an honest broker and that having him front and centre of the OIC is a mistake of enormous proportions". You mean there won't be an OIC Convention this year? Wasn't Raff supposed to sing ? And what about all those glowing letters Norwood wrote to Raff ? Oh, the humanity !! I think that James Norwood comes out of this well. Nevertheless, it is good to see that James is safely off the Titanic. He lived to tell the tale. Bravo, sir ! Kudos to Joe Backes and Lance Uppercut. How shameful that a professor (glad my kids don't have him teaching them) like Fetzer should back such idiocy and not respect a fellow professor and former Chair. How pathetic and sad!